Not the Same Old Annual Meeting: The Colorado AAUP’s Shared Governance Conference in Durango. 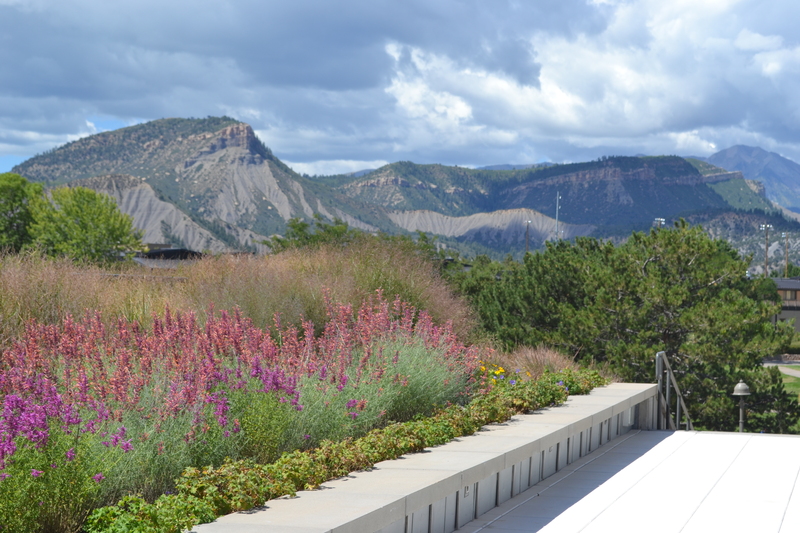 The view from Fort Lewis College in Durango, CO.
On September 5th, 2014, the Colorado Conference of the AAUP held its annual meeting. Rather than have the same kind of gathering we always do, the state leadership decided to devote the whole day to one theme: shared governance. We also decided to hold the meeting in Durango, home of the Fort Lewis College chapter which has gone from having no AAUP chapter to being the largest chapter in the state in less than a year. Our conference was a huge success, drawing between 35 and 50 people at different times during the day. It was also a wonderful opportunity to highlight the extraordinary range of expertise that our conference members possess. What follows is a brief summary of the presentations. Panel #1 from left to right: Miranda Merklein of Santa Fe Community College, Tom Acker of Mesa State, Tim McGettigan of Colorado State University – Pueblo and Brian Burke of Fort Lewis. After introductory remarks, we kicked off the conference with a panel on the state of shared governance in Colorado and beyond, thanks to our guest from New Mexico, Miranda Merklein. The idea was to get some of the problems on the table first, so that solutions could be considered for the rest of the day. 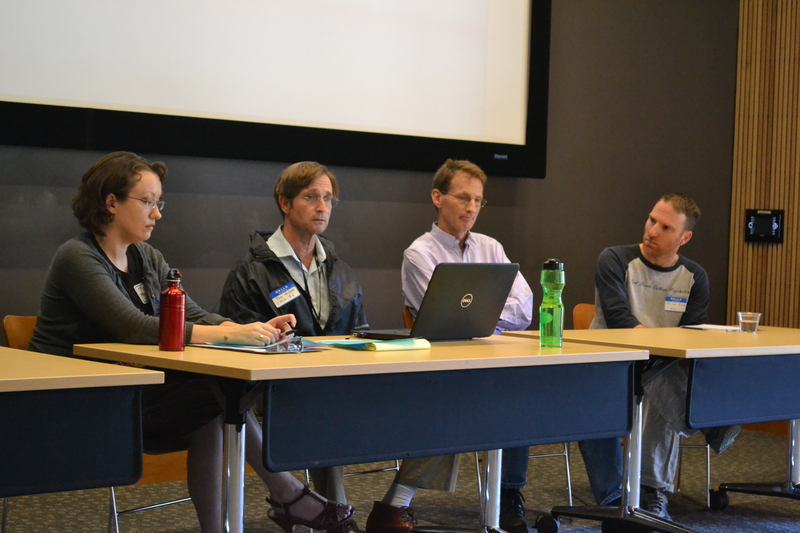 While some of the stories that got told have already appeared in local newspapers and (in the case of CSU-Pueblo) the higher education press, each of the panelists gave a faculty-level view of what shared governance problems look like and what can be done to combat them. The great thing about a panel like this was that it allowed everyone to hear what they’re colleagues are going through and (if nothing else) made it clear that none of us are alone. Panel #2 from left to right: Don Eron of CU-Boulder, Jane Fraser of CSU-Pueblo, Jonathan Poritz of CSU-Pueblo and State Co-President Steve Mumme of CSU-Fort Collins. Our second panel concerned best practices in shared governance. The advice was far-reaching, ranging from electronic communications policies to faculty representation in governance matters to simply understanding your own employee handbook. Co-President Steve Mumme’s presentation deserves special mention because he went back to some of the key statements emanating from the AAUP, the kind that tend to show up quoted in pieces in administrative statements and handbook language, and placed that language in its entire original context. The key takeaway: Don’t let anybody tell you what AAUP language means. Look at what the AAUP itself has to say about the concepts that it has pioneered during its nearly one hundred years of existence. Our third panel was about adjunct labor and adjunct labor conditions. While not strictly a shared governance issue our caucus believes that adjunct labor issues are the most important issue that higher education faces because they underly everything else we do. Richard Wagner of Metro State in Denver spoke about what full-time faculty can do to improve the lives of adjuncts. Suzanne Hudson of CU-Boulder spoke about what the caucus has already done to improve the lives of adjuncts. Miranda Merklein of Santa Fe Community College and Caprice Lawless of Front Range Community College spoke about their experiences organizing adjuncts. 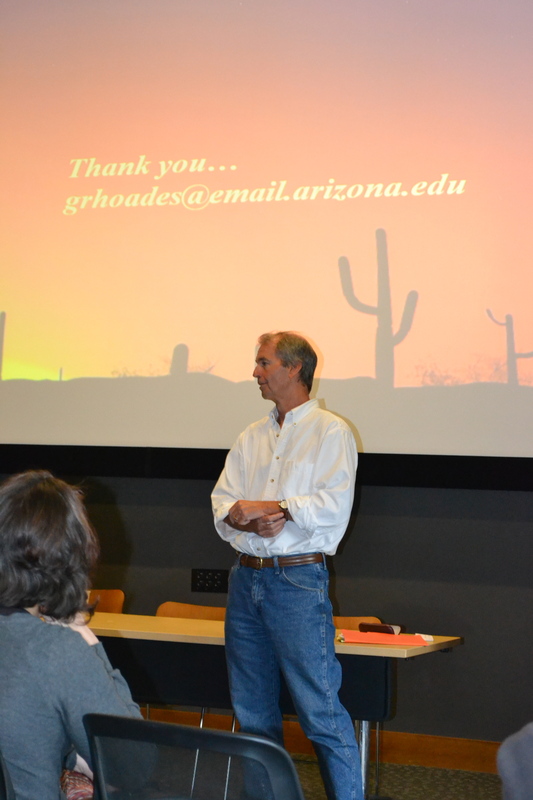 Gary Rhoades of the University of Arizona, delivering his keynote address. The conference concluded with an address from Gary Rhoades, former national AAUP General Secretary and head of the Center for the Study of Higher Education at the University of Arizona. 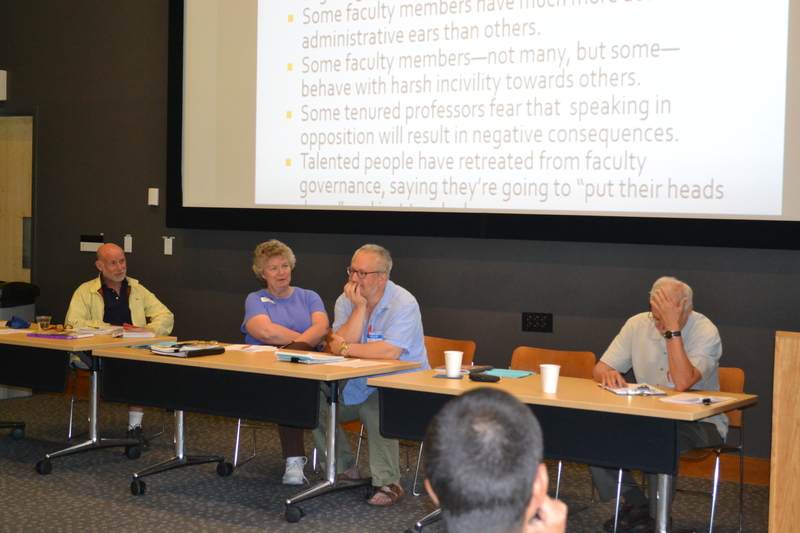 Gary tailored his speech to address the shared governance concerns at Fort Lewis, but he also made many general points that applied to faculty across Colorado. For example, he noted that Colorado has been subject to an enormous amount of attention by the American Councils of Trustees and Alumni (ACTA) a group which has little respect for the idea of shared governance. He also noted how IT offices have become increasingly important power sources on universities across America and how university attorneys have become increasingly active policy-shapers in recent years. Perhaps most importantly, Gary explained that in order for administrations to enact permanent reforms on campuses, they should respect shared governance so that faculty feel they have a stake in whatever those changes happen to be. All-in-all, the executive committee of the Colorado AAUP was very pleased with the conference and it looks forward in trying something similar around a different theme before too long. Oh yes. Thank you, AAUP-Fort Lewis chapter! Thank you to every Fort Lewis member on my e-mail list (and you know who you are) for the work you did to make that meeting possible. May your chapter live long and prosper. Thanks for being such a great host, Jonathan. It means so much for those of us isolated here in New Mexico to know that we’re not alone.